Probably the best seared salmon you will ever taste, and the easiest to cook! Make this for a fast but healthy dinner and watch everyone ask for it again and again! This must be one of the easiest recipes I’ve made in a long time, and that’s cool because seared salmon or any seafood should never be complicated. Another great way to cook it is on the grill, so easy and loaded with flavor. I added some cherry tomatoes and fresh tarragon to my cast iron skillet. Salmon is a fish that only needs a little bit of seasoning and maybe a few other simple ingredients to make it stand out. The key part to proudly putting salmon on your dinner table is in the cooking. Whichever method you decide to end up going with, make sure to cook it fast and with a high heat and a cast iron skillet is perfect for this! 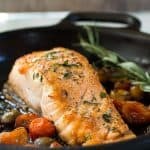 Using my skillet is my favorite way to cook seared salmon. I heat my pan up until it’s really stinkin’ hot and then gently lay the salmon into the pan, skin side up first, to capture that crusty top. This seals in all of the healthy oils that the salmon has. Then, turn the salmon over onto its skin side and finish the cooking in a hot oven. You’ll know the salmon is ready by lightly pressing down on it with your finger. If it feels tight and not spongy, then it should be ready to serve. Let it rest for a few minutes just as you would a steak. This ensures that the juice and flavor stay inside the seared salmon. 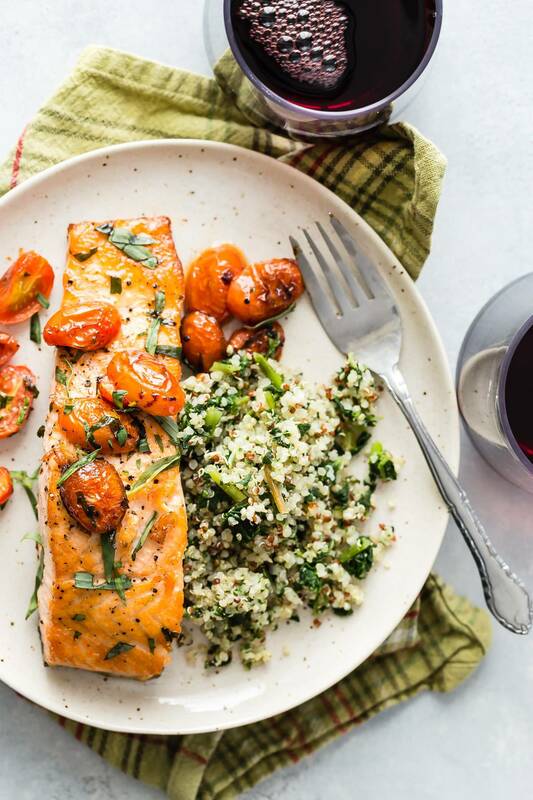 Which oil should I use to cook my salmon? I mentioned having the pan really hot so using the proper oil is important, otherwise, you’ll be jumping up and frantically waving a towel at your kitchen smoke detector. As an ambassador and Pantry Insider for Pompeian Oils and Vinegars, I was allowed to try the brand new Avocado Oil Non-Stick Cooking Spray. With a smoke point of 500 degrees, it was perfect for searing my salmon. It’s 100% avocado oil and packed with monounsaturated fats, not to mention being super eco-friendly. It doesn’t use any propellants or CFC’s to produce the fine mist that covers your pan easily, and without the foam build up that you often get from other spray oils. I also loved using it to lightly spray the salmon before I seasoned it – I’d never have done this with any other spray oil. Remember, don’t be scared to crank up the heat, get that pan hot, and cook some of the juiciest salmon ever! Another oil that can be used is canola or vegetable oil, these will work just fine if you don’t have the avocado oil. I know you’ll love this seared salmon recipe, but be sure to try my other salmon recipes like Grilled Salmon Kebabs with Orange or maybe an easy One Pan Mustard Glazed Salmon is perfect for a quick and mess-free dinner! As a #pantryinsider for Pompeian Oils and Vinegars, compensation was provided, but recipe ideas and thoughts are my own. This blog post was recently updated. Probably the best seared salmon you might ever taste, and the easiest to cook! Make this for a fast but healthy dinner and watch everyone ask for it again and again! Lightly spray the salmon with the avocado oil spray. 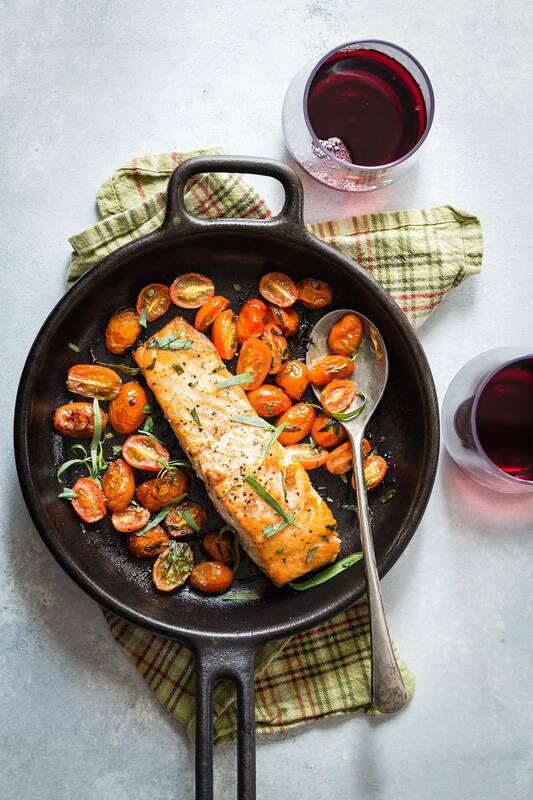 Heat a cast-iron pan, large enough to fit both pieces of salmon over a high heat for about 1 minute. Generously spray the pan with the avocado oil spray. Place the salmon into the pan, skin side up and sear for about 1 minute. Using a spatula, carefully turn the salmon over onto the skin side. Add the tomatoes around the fish and sprinkle with the chopped tarragon. Finally add the butter in two pieces to each side of the pan. Place the pan into the oven and roast for 8-10 minutes. The salmon I used was about 2 inches wide and 1½ inches tall. If your salmon is thinner, it will cook faster. Try and buy center pieces and not from the tail end. You can usually tell it's ready by gently pressing the thickest part with a finger - it should feel slightly firm. It will cook fast and keep cooking even after you take it out of the oven. It's always better to take it out early and not overcook it. This looks so incredibly. We’ve been looking for a salmon recipe and this is exactly what we need to try! Great meeting you this weekend in Nashville! Likewise Matt, such a lot of fun! Greg, I’ve seen some of those dinner party recipes and you could be TK!! I love how easy salmon can be to prepare! This looks so yummy. I’ve never used avocado oil. I need to snag some if I ever see it in our markets. This salmon looks great, Stevie would love it. Gorgeous dish! I need to be on the look out for this oil spray! Thanks Anna, it’s super helpful and easy to work with! This high temp oil has been missing from my arsenal for grilling. Normally I just go with a canola or peanut oil but I’ll try this one out as soon as I can find it. Great post. 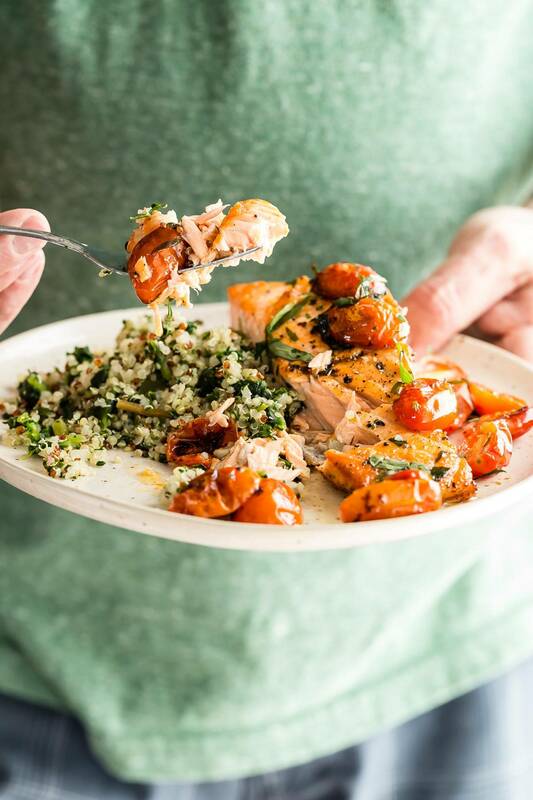 I love the seared salmon and roasted tomato combo! We use to order something similar with halibut in a roasted tomato wine sauce at our favorite restaurant. I think it was called Acqua Pazza. Sooooo good! It must be the week for Salmon because I made it also. Looks delicious! This recipe looks fantastic and I can’t wait to try it; however, I need to find a replacement for the butter as I cannot consume dairy. Can you help out with a substitution recommendation? I’d greatly appreciate it! This recipe looks fantastic and I can’t wait to try it; however, I need to find a replacement for the butter as I cannot consume dairy. Can you help out with a substitution suggestion? I’d greatly appreciate it! Hi! Quick question- are you able to substitute out the tomatoes + tarragon for another veggie and herb?? Would asparagus work in here you think? Any suggestions?? I have always baked salmon, so I cannot wait to sear it in my iron skillet. Thankfully Pinterest led me to this recipe!! Thanks!!!! – Liss. Thoroughly enjoyed this recipe! It is easy! End result is moist tasty salmon! My husband really enjoyed it and we’ll make it for friends in the future! I just made this salmon and it was absolutely INCREDIBLE. This will now be on my “Impress Them” rotation of meals. Thank you so very much for something so simple, clean, and DELICIOUS! Hey Vanessa, so glad you liked it and thanks for letting me know!! Hello – I am not sure if you are aware, but there is a catering company called Crave Catering in Reno, NV that has several images posted on their business page (which is their only page for looking into their work) which is how I came to find a caterer for my wedding…. The images of “his” food were what sold me. I just looked at his most recent food post and searched the ingredients as shown in the picture and it led me directly to your page. Your Picture. He is leading people to believe this, along with many of the others, is his work. I just wanted to make you aware. You can look it up on Facebook under Crave Catering Reno, NV. Thanks Joy, I really appreciate you taking the time to notify me, I’ve left a message and will wait to see what happens. Thanks again! 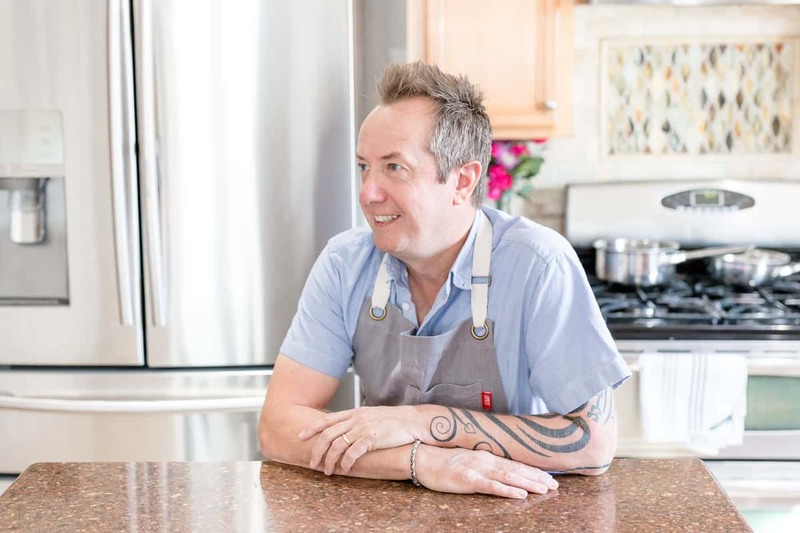 New to cooking and new to your site. . . So do I heat the iron skillet on the stove, sear 1 side and finish cooking the salmon by transferring the skillet to the oven at 450? This is exactly how I like to cook my salmon! Delicious! I made salmon in your recipe using new frying oil a Chef friend gave me. Refined high oleic sunflower oil with 83% monounsaturated fat (that’s the one doctors say is the good fat, same one as in olive oil). The dish came out amazing. Thanks. Did any one else hear about this oil, it’s called Sunvella Frypure? Try it? What do you think? That recipe just spends 7 minutes to cook? So quick it is!! If i don’t have Avocado oil ,which is the most suitable vegetable oil can be use to replace it? Everything looks delicious! What was in the quinoa side dish? Made this tonight with wild caught coho. I only had fresh thyme, but it was a lovely substitute. The tomatoes were local, fresh, heirloom; really juicy and sweet. They made the dish. A great flavor with the salmon, simply salted and peppered. And GREAT cooked in the cast iron skillet. Thanks for the idea! Coho is epic Marilee, thanks for the feedback! this is my fav recipe of yours! Seafood wise. But when do I not like your recipes? Gah, EPIC! YUM! Love how simple and flavorful this looks!! Cannot wait to try it!! So healthy, love this kind of dinner! Intrigued by the tarragon – yum! Such a perfect fresh and easy dish! Everything tastes better in cast iron! This is EXACTLY what I love to eat- so delicious! Great recipe. Made it with Fresh Kokanee Salmon we caught out of upper Twin Lakes in Bridgeport California. It was awesome. Nothing better than Lake to Table I’m 2 Hrs. Thank you very much, Jim Sears. This was my first time cooking salmon. It turned out perfect!! The instructions and video really helped. Thank you!! Thanks, Demetrious, good to hear!!! Great and simple, thank you!